This formula is effective for early stage of pathogenic wind heat marked by dry cough and sore throat. Use before symptoms of phlegm heat develop. 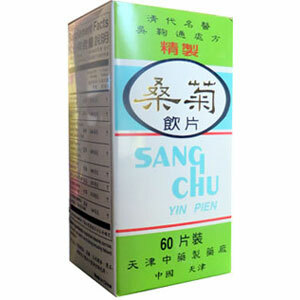 Sang Chu Yin Pien supports the health of the immune system, the head, and the upper respiratory system (nose, throat, sinuses, and larynx). Adults, take 4 to 8 tablets, 3 times a day. Do not exceed the number of tablets recommended. Do not give to infants. Use with caution with giving to children or in cases of diarrhea. Keep out of reach of children.